Ryan works with Valentina, a natural lifestyle blogger from Italy (site: The Soul Garden), and helps her optimize her blog, build her network of connections, and start building revenue streams. If you have any interest in starting or growing a blog (and come on, who doesn't have a blog?! ), then it's a total no-brainer to learn from someone who's made a living from blogging for years. So watch this session :) (oh, and if you want to use your blog as your primary income stream, then DEFINITELY don't miss this one). [16:55] Tag clouds: should you keep or remove them? [58:00] How often do you need to post to your blog? Ryan's one of those cool dudes who doesn't just talk the talk...but he walks the walk. 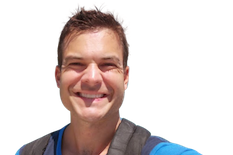 He's been traveling the world while generating income through blogging for the past 5 years at Blogging From Paradise, scoring features on sites like Richard Branson's Virgin blog, Forbes, NeilPatel.com (another GYBL expert), Pro Blogger, and more. He's even spoken at NYU (quite an accomplishment, in case you don't know anything about them).